How’s your digital transformation going? What processes are you focusing on? Who’s leading the transformation? What technologies are a priority? What challenges do you face? To answer these questions, tap into the Forrester Data Global Business Technographics® Business And Technology Services Survey of your peers. 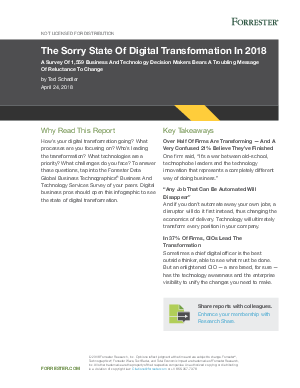 Digital business pros should open this infographic to see the state of digital transformation. This Forrester report, sponsored by Systemware, will help enterprise architecture (EA) professionals make informed decisions about their content management agenda.